I swear you better not invite me over to your house to watch WWE Network and try to serve me purple drank in some stank old glass you got with your kids meal back in the day. Unless it's a Star Wars one that I don't have, cause then I will totally make that sucker disappear in my shirt sleeve and make a hasty exit after a sudden bout of food poisoning. I require my beverages to be served in vessels worthy of the feudal lord I am destined to become. Just when all hope seems to be lost I discover these gems. 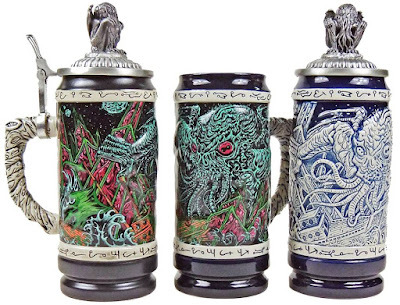 You may know Skinner as the modern renaissance man responsible for twisted plastic monsters, horrifying works of art, and even short films to accompany musical performances, but now you can add designer of epic drink wear to his list of accomplishments with these beer mugs from Münkstein. Good lord almighty how would you drink out of anything else ever again? From what I hear Odin himself just threw out all the mead mugs in Valhalla and replaced them with these. It must be true if I read it on the Internet, so why would you not jump at the chance to sip your Kool Aid from the same objects that worthy dead Vikings do? Here's the info you need: the steins will only be available for three months, while the lidless mugs will be available for the foreseeable future. You can chose from either the full color design or the dynamic wash, or get one of each for when you have company. All the details you need to up your juice game are located at www.munkstein.com.